This site showcases the works of King 'Afa giving everyone insight into his vision of the art of the South Pacific Islanders. 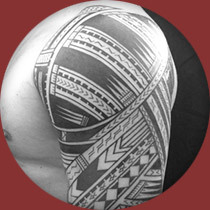 There is more than 1 type of Polynesian tattoo and King 'Afa designs body art for a diverse group of people ranging in age, gender, ethnicity, religious backgrounds and other subgroups. He has grown over the years tailoring his style to be unique and unparalleled in the tattoo industry. Clients are encouraged to be involved in the creation of their artwork as they work together to make an unmatched tattoo created specifically for you. The California Safe Body Act requires that prior to the performance of body art, the client(You) shall read, complete and sign an informed consent/medical form that shall include, but not limited total of the following. eczema, psoriasis, freckles, moles or sunburn in the area to be tattooed that may interfere with said tattoo. If I have any type of infection or rash anywhere on my body, I will advise the Artist.____I AM NOT A RECIPIENT of an ORGAN OR BONE MARROW TRANSPLANT or, if I am, I have taken the prescribed preventive regimen of antibiotics that is required by my doctor in advance of any invasive procedure such as tattooing or piercing. ____I DO NOT HAVE MENTAL IMPAIRMENT that may affect my judgment in getting the tattoo. ____I DO NOT HAVE ALLERGIC REACTIONS TO LATEX. I UNDERSTAND RISKS OF BLOODBORNE PATHOGEN EXPOSURE. To my knowledge, I do not have a physical, mental or medical impairment or disability which might affect my well being as a direct or indirect result of my decision to have a tattoo. HIV INFECTIONS ) should consult their personal physician prior to being tattooed or pierced. Persons with a pre-existing CARDIAC CONDITIONS, especially when piercing occurs on areas of the body involving the mucous membranes, may result in bacteria in the blood stream which can further damage the heart, and that such persons should seek permission from their personal physician prior to receiving a piercing or tattoo. NEITHER THE TATTOO ARTIST, STUDIO OR EVENT is responsible for the meaning or spelling of the symbol or text that I have provided to them, chosen from the design or drawn, designed by the artist by my direction. ____I REALIZED THE VARIATIONS IN COLOR and design may exist between the tattoo art. I have selected and the actual tattoo when it is applied to my body/skin. ____I also understand over time, the colors and the clarity of MY TATTOO WILL FADE DUE TO UNPROTECTED EXPOSURE TO THE SUN and NATURALLY OCCURRING DISPERSION OF PIGMENT UNDER THE SKIN. ____I understand that if my skin color is dark, the colors will not appear as bright as they do on light skin. • I understand that if I have any skin treatments, laser hair removal, plastic surgery or other skin altering procedures, it may result in adverse changes to my tattoo. I release all rights to any photographs, taken of me and the tattoo and give consent in advance to their reproduction in print or electronic form including, but not limited to social media, artist’s website and portfolio.